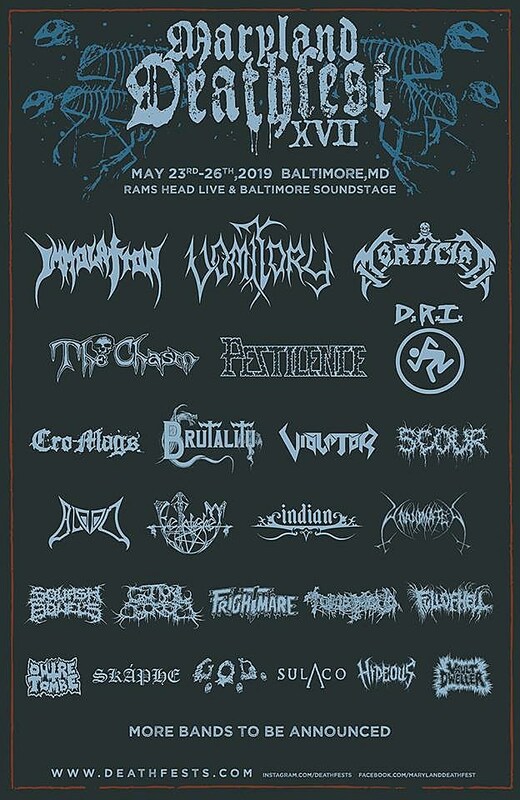 Annual Baltimore metal festival Maryland Deathfest returns in 2019 from May 23-26 to Rams Head Live and Baltimore Soundstage, and the first round of bands was just announced. It includes Bethlehem, Cro-Mags, D.R.I., Full of Hell, Hideous, Immolation, Indian, Mortician, Scour, Brutality, The Chasm, Frightmare, Grotesque Organ Defilement, Guttural Secrete, Outre-Tomb, Pestilence, Skaphe, Squash Bowels, Sulaco, Tomb Mold, Vault Dweller, and exclusive U.S. appearances from Germany’s Blood, Sweden’s Unanimated, Brazil’s Violator, and Sweden’s Vomitory. Early bird passes go on sale today (6/18) at 11 AM. Stay tuned for more MDF announcements.